It looked like one of their biggest weaknesses coming in to the 2016 season, and yet, almost a third of the way through the year, the Nationals bullpen has been a strength. Among NL bullpens, it ranks 1st in ERA, 2nd in OPS against, and 1st in K/BB. Yet, only Shawn Kelley (#8), Sammy Solis (#15), and Yusmeiro Petit (#37) rank in the top 40 in ERA among NL relievers. In terms of WPA (Win Probability Added), Felipe Rivero is 14th in the NL, Petit is 26th, the rest of the team is 40th or lower. The guys in the bullpen, for the most part, haven’t been having spectacular individual seasons. You probably could say it for Kelley, but maybe nobody else. Nevertheless, the bullpen as a whole has been pretty dominant. What gives? One of the biggest reasons is the starting pitching. The bullpen ranks second to last in innings pitched, sitting in between the Cubs and the Mets, two other teams with stellar starting pitching. Not having to turn to the bullpen in the middle innings is helpful. But that isn’t the whole story. Instead the story might be one of how they are used. If you are thinking they are mostly using one or two guys, that’s really not the case. Rivero has the most appearances in the NL, 27. But Blake Treinen is right behind with 24 appearances, next down the list is Kelley and Jonathan Papelbon, with 22 appearances each, followed by Oliver Perez with 21. Those five pitchers have pretty well evenly split up the workload. Throw in Petit who has been used effectively in that long relief role, and the Nats seem to have 6 men they are comfortable using. Nobody seems to be overworked right now, although Rivero is worthy of some concern. He has been used, but not abused, at least not yet. Being on pace for 83 appearances is a bit high, it would put him just barely above last year’s leader Kevin Siegrist’s 81. But we also don’t need to worry too much yet. There were 36 relievers who appeared in 70 games or more last year, 39 the year before. There’s no real reason to think he’s been overworked yet, but it would be foolish to not keep an eye on this. The Nats should try to pace him a little bit more. Aside from frequency, the method of use of Rivero seems to highlight what the Nats are doing with the bullpen, especially when you consider he ranks right around 15th in relief innings pitched, despite topping the appearances list. He is really being used in the highest-leverage situations, something that should be of interest to those who espouse the flawed importance of the closer. If the Nats want to keep those appearances manageable, though, they need to be willing to do this with other guys a bit more often. And don’t get me wrong, they have shown willingness to use Treinen and Kelley in this role, too. And with the way Kelley has pitched, why not? They just may have to do it a bit more. The bullpen has been more than the sum of its parts, something that isn’t always easy to do in this sport. It might be taken as a sign of a good manager, a good pitching coach, or both. Dusty Baker certainly has had his issues in the past, but so far he seems to be managing the bullpen quite well. How much influence comes from Mike Maddux is hard to know, and probably wouldn’t be something they’d openly discuss. Between the limited innings and the flexible use of relievers, the Nats bullpen has made it through the first third of the season as an asset to the team. So, while down in Triple-A righty Erik Davis is dominating with a 1.89 ERA and 23 K in 19 IP, and lefty Matt Grace has a 2.36 ERA as lefties hit .219 against him, they’ll have to wait. And young fireballer Trevor Gott can continue to work on harnessing his 97 mph stuff. 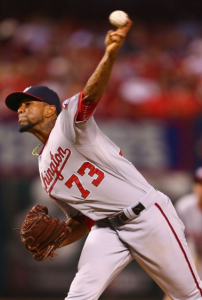 The Nats could probably use one more shut down reliever, just like 29 other teams. And maybe one of those three guys are it. But for now, the bullpen seems to be doing just fine. Actually, they’re doing better than fine, they’re one of the best bullpens in baseball, despite not having the best relievers in baseball.